“Charging Forward” (2001) by Jay Laber. Photo taken in July 2013. This last July, Molly and I took a solid but much-too-short tour of the northern inter-mountain American West. This was in part vacation, part research (ever since reading John Barnes 2008 article in The Public Historian on the Bear River Massacre, I had been determined to visit the site myself), and part visiting and catching up with our family and friends. We dropped in on Livingston and Missoula, Montana; Salmon, Idaho; Salt Lake City, Utah; Cheyenne, Wyoming; Spearfish, South Dakota; and Bismarck, North Dakota. Another part that comes along with a research-vacation-visitation such as this is that one invariably stumbles into the unanticipated, and that’s exactly what happened while on the University of Montana campus. 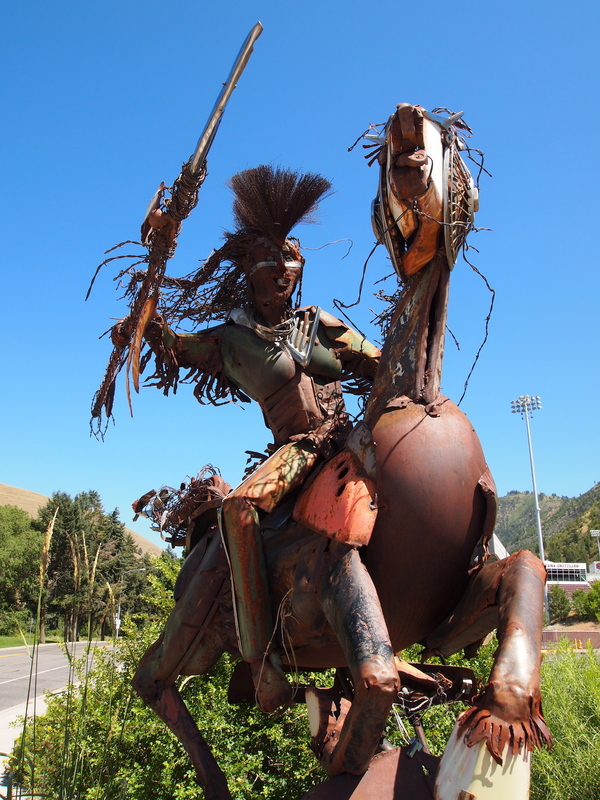 The sculpture pictured here is by Jay Laber (Blackfeet), “Charging Forward” (2001). When we came across this work of industrial indigenous art, it reminded me a bit of how two worlds were blending: the pre-Industrial world of the plains indigenes portrayed through the industrial and post-industrial medium of welding and scrap metal (those found objects). In my own memory bank, it caused me to think about Mad Max films and a scrap yard that used to be on the east edge of Main in Bismarck (just behind the Big Boy). Art is fun that way, whether poetry or sculpture or you name it. The randomness triggers the unanticipated, those memories we forgot about or didn’t know existed. Laber has inspired me. This entry was posted on Wednesday, November 13th, 2013 at 3:36 pm	and tagged with American West, Blackfeet, Jay Laber, Missoula, Montana, Native America and posted in Uncategorized. You can follow any responses to this entry through the RSS 2.0 feed. Hi, Aaron—beautiful photo. We are working on a book about the native nations of the plains, and we’re interested in using the photo in a chapter on the Blackfeet nation. Would you be willing to provide us with this image for our book? We would cite you as the photographer in the photo credits. Fascinated to hear that my article prompted to you visit the Bear River site. It was a visit to the site that first prompted me to write the thesis on which I based the article. The site had a tremendous impact on me and I hope it did on you as well.